Have you ever aspired to open your pizzeria or simply to learn the art of Neapolitan Pizza? 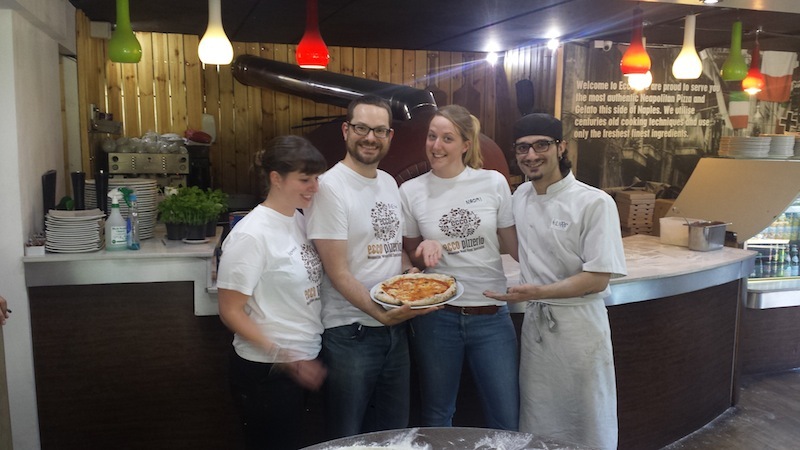 Here at Ecco we now offer a Training Course in the preparation of authentic Neapolitan Pizza. The course is for any budding pizza lover or for trained or trainee pizza makers who would like to keep alive the ancient tradition of Neapolitan pizza. The course will be both theoretical and practical in nature. The course is very hands on and there will be a lot of hands on practice during the day and within our Pizzeria under the supervision of our chefs. Over the course of the 5 days you will be absorbed into the world of Neapolitan Pizza. The training will last 40-60 hours over the 5 day period and will take place within one of our Pizzerias. Our Master Chef will teach you the main techniques on how to prepare the dough, prepare different toppings, learn how to use a wood-burning oven so that it is at the correct temperature to make a perfect pizza every time. You will learn the art of keeping things simple and letting the ingredients speak for themselves through the traditional techniques that have been used in Naples for centuries. The training is divided into three parts with an examination to finalise the training. Theory – The course will begin with some theory, discussing the origins of Neapolitan Pizza and what makes it unique. It will give useful information about the products that are used for the making of an authentic Neapolitan Pizza and also about the tools and techniques used. We will also give some guidance regarding Health Safety and Hygiene within a professional kitchen environment. School – You are going to spend a lot of time practising to prepare the dough, prepare the toppings, forming the balls, cooking the pizzas and learning which tools work best as well as operating a wood fire oven. Our chef will share his knowledge and secrets even into the finer details such as preparing the tomatoes and looking at which combinations of toppings work well together. Professional Stage – At this stage you will practise what has been taught by initially preparing your own ingredients which you will use in the class the next day. You will also watch the Pizza chefs while they are working during service in the Pizzeria and assist them. You are welcome to ask questions and get any tips from them. The final stage will be to practice making pizzas during service under the supervision of the pizza makers. Exam – There will be an exam at the end of the course with 30 questions. A pass rate of 80 % will be required. At the end of the Training all students that pass the exam will get a certificate for attending the course which will certify that they have attended the course at Ecco Pizzeria, however this is not an official accreditation. Each course will start on a Monday and end on a Friday. The maximum participants within the group will be 6 students, however if a larger group would like to partake then this can be arranged. The course will begin each morning with training given in the day and then there will be training during the service in the evenings. You will be provided with a uniform to wear when you arrive. There will also be an Interpreter who will be translating on behalf of our Neapolitan Chefs. The price of the course is £1500. You will be provided with a uniform and a detailed manual at the end of the course. If you are interested in taking the course please fill in your details on the form below and we will be in touch.